Kalpana Chawla was 40 years, 10 months	& 15 days old age. Kalpana Chawla was born on 17-03-1962 in Karnal in the state of Haryana, India. She was an Indian-born American Astronaut, Engineer & Scientist. Kalpana Chawla came from a very humble background and did her schooling from Karnal. She obtained her graduation degree in Aeronautical Engineering from the Punjab Engineering College in Chandigarh. Thereafter, she moved to the US and obtained her Master’s degree Aeronautical Engineering from the University of Texas, U.S. She completed her second Masters and also did PhD in aerospace engineering in Boulder from the University of Colorado. Since then she was employed at NASA. She joined NASA Astronaut Corp and selected for her maiden flight in the year 1998. In her first flight, she travelled a distance of around 10.4 million Kilometres. Thereby, she created history by becoming the first ever Indian women to travel space. She was only the second Indian since Rakesh Sharma to travel in a spacecraft. She stationed the malfunctioned Satellite, Spartan. After her first successful mission, she was again picked for her second mission in 2000. Unfortunately, due to some technical faults, the mission got delayed. In 2003, she aboard the space shuttle for the STS-107 mission. She along with six other crew members were a part of the ill-fated mission. While their entry into the Earth, their spacecraft got disintegrated and Kalpana Chawla along with crew members was lost. She got several recognition and awards for her contributions. Both Indian and American governments honoured her on numerous occasions. 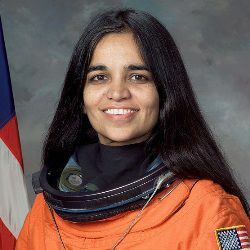 Kalpana Chawla died on 01-02-2003 in Texes, United States. The space shuttle disintegrated while re-entry into the atmosphere of Earth and she died alongwith seven crew members in the Space Shuttle Columbia disaster just landing before 16 minutes. She was born to Sanjyothi Chawla and Banarasi Lal Chawla. She had two sisters Deepa and Sunita. She had a brother named Sanjay. She was married to her flying instructor named Jean Pierre Harrison and became a US citizen.